It’s natural hair wash day. You’ve got your special shampoo or cleansing cream or co-wash or whatever. You’ve got your conditioner, deep or otherwise. You’ve cleansed your hair. Now what? How do you dry your hair? I realize many naturals have different methods. And over time we have developed all kinds of terms for hair drying and styling methods. Take for example, plopping, which is all the rage, especially amongst those with looser curl patterns (speaking of plopping, Kimberly Walker made a funny parody video about crazy names for hair drying/styling techniques, click here to check it out). My confession is, I don’t really have a hair drying method. When the weather is warm, my personal preference is to air dry my hair, and if I’m in a hurry I reach for a hair towel to gently absorb the moisture. When the weather turns cool, I use my blow dryer on a cool setting (sometimes with the diffuser). I figured out what worked for me based on my lifestyle and needs. But you know I always like to reach out to the professionals. I asked professional hairstylist Susan Peterkin-Bishop, owner of the Jaha Hair Salon in Maryland, and creator of the Natural Hair Industry Convention set to take place this November 1 (click here to buy tickets)! Susan cut my hair during her visit to Chicago with the SheaMoisture pop up event I hosted, and I was struck by her warmth and her wisdom. Susan knows SO much about hair, I wanted to interview her right then and there! She is a proud Jamaican and we shared many island hair memories during our interview. Susan has many beautiful memories of growing up in Jamaica when they would use castor oil and wear their natural hair in Bantu knots to style and protect it. As a blogger, I am happy to share what I know based on what I’ve experienced and what works for me. I love talking to people whose job it is to touch, manage and style all kinds and all textures of hair, people who can speak from real life, hands on experience. Susan came through with the professional advice! For bellas who like a twist-and-go style, Susan has specific hair drying advice. “If you don’t have the time, go under the dryer, medium heat for maybe about 5 minutes to take some of the water out of it. Then use a low heat blow dryer, just for a few minutes with your hair really moisturized. The hand blow dryer is just to get a little length to it, to twist or style your hair. Not to dry it all the way out. So after the hooded dryer for 5 minutes, THEN proceed to twist,” she recommends. For those of us at home who maybe don’t have both a hooded and a handheld hair dryer, Susan offered the following tips. – Don’t ever rub your hair with a towel. Wrap and squeeze. Even if the hair is very long, you can wrap it and then gently squeeze it. Don’t wring your hair out. Be gentle with it. – When it comes to drying implements, use whatever works for you. Terry cloth towels can be bad for your hair and lead to snarls and pulling. Many naturals use microfiber towels – I used to buy hers from auto stores. Many naturals dry their hair with teeshirts. It’s your preference. Wrap it just long enough to be able to absorb the water. Wrap it gently, not tight. – If you use the LOC method, don’t dry your hair completely. You need that moisture in the hair to work with the cream and the oil so the hair can be styled properly for your twists/braided styles. Hopefully Susan’s tips and insights were as helpful to you as they were to me. How do you dry your natural hair? Oh no, I have been using wrong way to dry my hair. Thank you loads for the helpful tips! Great post on drying hair the right way. 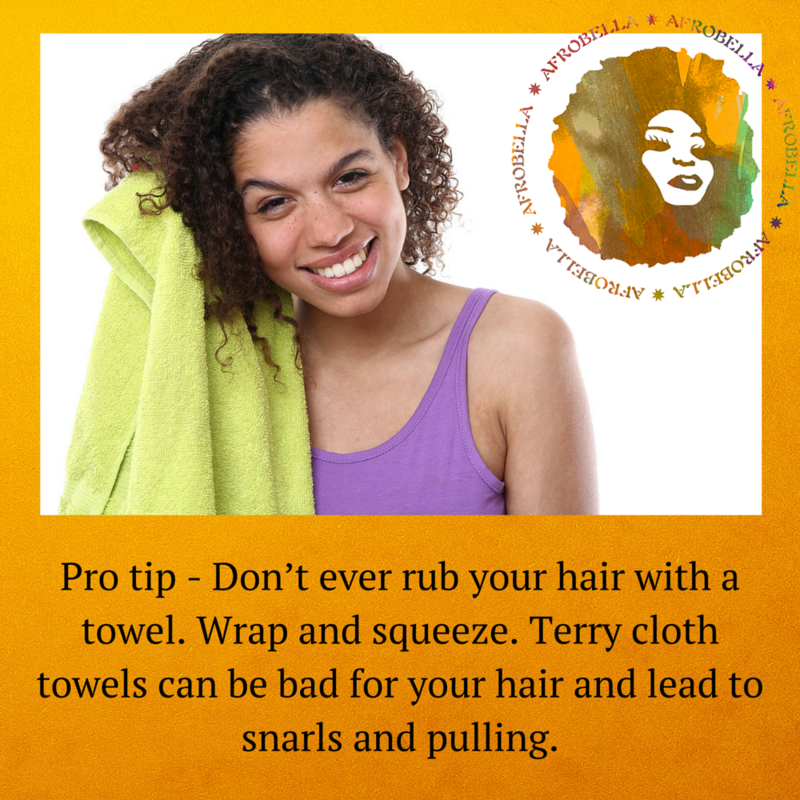 Not many know toweling wrong alone can be detrimental to their hair health. Terry towel has never been my favorite for drying hair. I stick with soft cotton or linen towels and air dry my hair once the excess water is wrung out gently using a towel. I haven’t tried microfiber yet …. will try that soon! I use the curlycoils.com t-shirt towels. They are my favorite ones to use. They come in large sizes too!